We're now fully allocated for our 14x12 nucs for 2019. However we can still supply you with a national nuc which you can extend, or you can rotate out the frames in your hive throughout the season. Or we can put the extensions on for you just before you collect. Please email for prices. Spring Nucs will normally be ready towards end May though this is weather dependent. We understand that most of you will be excited to receive your bees but we do ask for you to be patient as until the season fully kicks in it is very difficult for us to convey time scales. As soon as your nucleus of bees is ready I will get in touch to let you know. Your nuc will be ready, bursting at the seams and be ready to be transferred into a full size hive when it leaves us. To give you an idea of how the years differ last year, 2016 and 2015 saw our spring nucs go out in middle May, 2014 our spring nucs went out in early June, 2013 they were not ready until the end of July and in 2012 they were ready mid June. 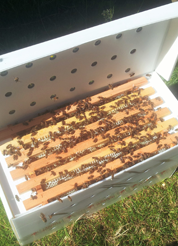 Our nucs on 14x12 frames are collection only and are sold in Poly nuc hives. 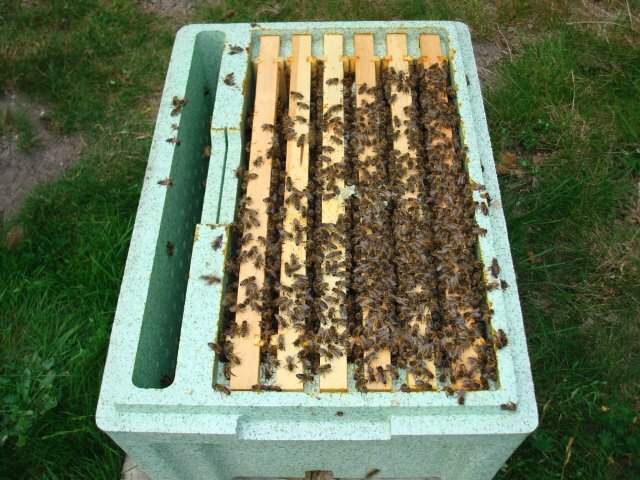 The poly nuc hive has a built in feeder and an open mesh floor. It is easy to transport the bees in the poly box and it is a handy piece of kit to keep in your bee shed. It is made from high density polystyrene which is very strong and has great insulation properties, keeping the bees cooler in the summer and warmer in the winter. We are taking orders now, you can place an order on-line with a deposit of £40 or you can email your order to me with your full details and I will email the invoice for the deposit. The balance will be due for payment just prior to collection.